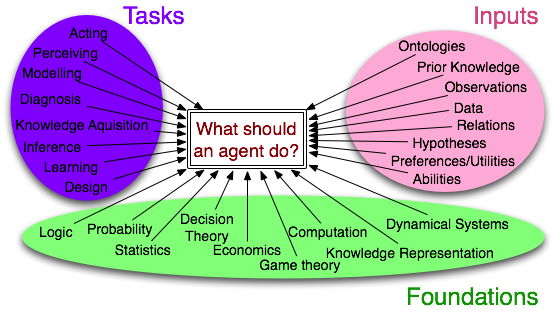 I am interested in the question: what should an intelligent agent do? Combining logic and probability/decision making or what is called relational probabilistic reasoning or statistical relational AI, particularly with respect to the independent choice logic (ICL) which allows for probabilistic modelling in terms of logic programs with probabilistic choices. ICL includes pure Prolog, Bayesian networks and MDPS as special cases. ICL expands the older probabilistic Horn abduction to choices by multiple agents and a richer logic (including negation as failure), and applications in decision making and planning. Probabilistic Horn abduction was one of the first probabilistic programming languages. There is related work in exploiting the structure implicit in representations for computational gain for probabilistic inference and decision making. Probabilistic Reasoning including Probabilistic Horn Abduction, Searching Bayesian Networks, Variable Elimination, Exploiting Contextual Independence in Probabilistic Inference, Decision Making Under Uncertainty and lifted inference. I used to work on Theorist, a framework for assumption-based logical reasoning. There is information on Early History, Default Reasoning vs Abduction, Specificity and Implementation, Diagnosis and Other Applications. I also have a list of all of my papers (many online) and some (old) online code. Some co-authors who have web pages: Craig Boutilier, Ronen Brafman, Randy Goebel, Peter Gorniak, Holger Hoos, Michael Horsch, Alan Mackworth, Yang Xiang, Nevin Zhang .